Beautiful is the word that keeps coming back to my mind. Gigantic elephants bathing in a stream, gorgeous and majestic snow-capped high mountains, clear skies and colorfully dressed people move in front of us. We travel through a monastery, cross a crystal-clear lake to get to a remote village where a king, father of seven children, still lives with twelve concubines, we hear a language that sounds foreign to me, and see people with painted faces dance and sing to the sound of an exotic music. The pitch of their voice is so high and clear that it is hard to believe that most of them are men. Their make-up displays real art, almost looking like miniature paintings. Then, we see Indian women lined-up in green lush wet lands catching fish. I wish I were there to embrace it all, hopping from one place to the next quickly. As usual, whenever we watch one of Michael Palin’s documentaries, the end result is the same. I am left dreaming of India and China, and if I close my eyes, I can almost imagine that I am traveling to the Himalayas with him. I wish! But I am only sitting in front of our TV screen, yet fascinated. Maybe it is where the dream starts before it actually takes shape for real, one day. 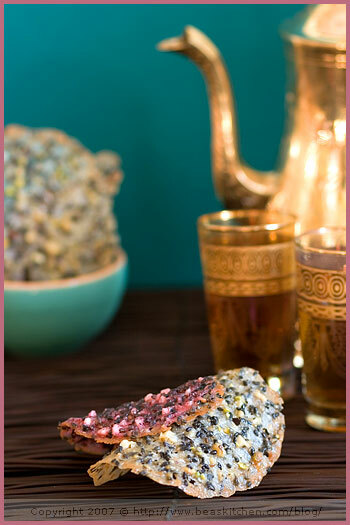 As we finish to watch the last disc of the Himalaya series, I cannot help but feel the need to prepare a little tea ceremony, where there will be hot black tea, and some beautiful light food, nearly too pretty to eat, reminiscent of the spectacular sceneries we have just watched. I think about the tuiles dentelles I have just baked. They seem perfect to savor the moment. And they are. Tuiles are a classic of French pastry that every French person inclined to baking must have at least once experimented with. If not, eaten for sure. The word tuile means tile, giving the name to the biscuit because of its shape. My grand-mother always had a batch whenever we visited, because unlike me, she never forgot to use up leftovers of egg whites. On their farm, such were things. You never wasted food. There is a difference, however, between the Classic Tuiles and Tuiles Dentelles. Unlike the traditional tuiles, Tuiles dentelles do not require egg whites. Instead, fruit juice is used. They cook quickly in a hot oven, and are shaped in a similar way to the traditional tuiles. Because of the use of fruit juice mixed with confectioner’s sugar, as they bake, they describe a pattern similar to lace, hence the name dentelle. Thinner and crispier, they are so light that you can easily forget that you are eating one, moving to the next quickly without realizing it. Inspired by Gamelle’s original idea, I decided to experiment with different flavors to create a variation on her recipe. I imagined Raspberry-Black Sesame Tuiles Dentelles. I discovered black sesame seeds a few years ago thanks to my friend K. who used to live in Japan and kept praising these delicate seeds. For good reason. They are delicious. Like her, I adopted them and at every opportunity I think of, I try to add them to food preparations. 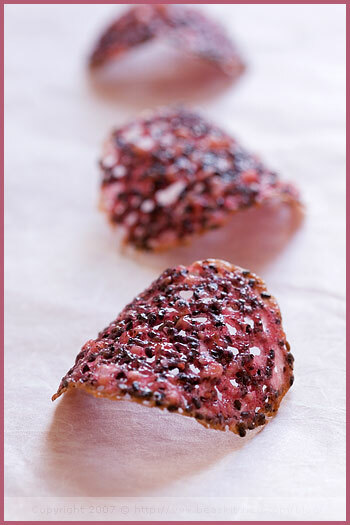 When I thought about Gamelle’s recipe, I immediately imagined the combination of pink and black together, and thought that I would combine raspberry juice and black sesame seeds. The texture of the tuiles was perfect, as crispy as I had hoped, and I was particularly pleased with the touch added by the black sesame seeds. A foreign memorable taste. 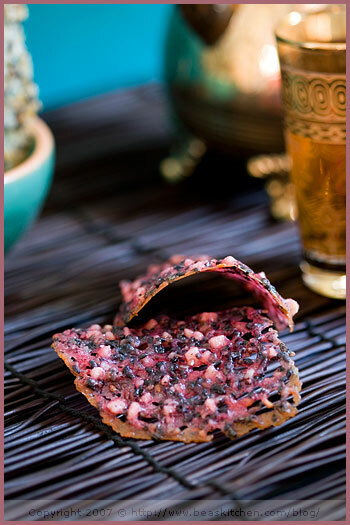 So perhaps these pink and black delicacies almost transported us to faraway lands. But next time of course, we have the hope that instead of sitting in our sofa, we will be there for real. I have always dreamed of seeing elephants bathe anyway. Note: This is one of the few times where giving exact measurement in ounces is difficult because of the little amounts required. A good precise scale is useful when it comes to situations like this. I am giving ounce measurement with grams between parenthesis. Mix fresh raspberries into a purée and strain them to collect their juice. Mix all the ingredients together, following the order in which they are listed. Place the batter in the fridge for 1 hour. Preheat your oven at 400 F. Take a baking sheet covered with a Silpat and place small tsp of batter that you space out. Cook for 3 to 4 mns, until the edge of the tuile looks golden. Remove from the oven and let cool for 1 mn or so, until you can remove them from the Silpat. Do this carefully as the tuiles are fragile. Shape them on a rolling pin and let cool before eating. Eat as you please! Mixez une barquette de framboises en purée. Passez-la au chinois pour en recueillir le jus. Mélangez tous les ingrédients dans l’ordre dans lequel ils sont indiqués, et mettez la préparation au frigo pendant 1 heure minimum. Préchauffez votre four à 200 C. Déposez des petites cuillerées espacées de 6 cm sur une plaque de cuisson recouverte d’un Silpat, puis faites cuire au four pendant 3 à 4 mns, jusqu’à ce que le bord des tuiles soit doré. Retirez les tuiles du four et laissez-les un peu refroidir avant de les décoller délicatement avec une spatule. Donnez-leur la forme choisie et laissez-les refroidir. Dégustez sans retenue ! Bea, these are gorgeous! My husband made tuiles for the first time a few weeks ago. The first batch didn’t quite work, but the second batch was delicious, and we ate them all! 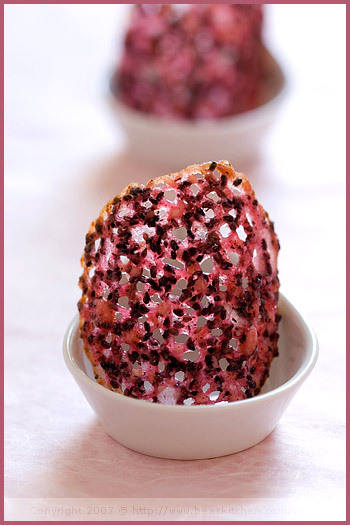 I’m forwarding this recipe to him, in case the tuile urge strikes again. I LOVE Michael Palin’s documentaries. And… these are beautiful. You are so detailed with your food and photos…it is a feast for the eyes. you first introduced me to the delight of tuiles in one of your posts way back, and for that i thank you very much! now, you have outdone yourself. so beautiful, and what a fantastically dreamy post! What a beautiful impression. those colours, the ingredients and your dreams of the far east. Your recipe sound delicious and I’m going to make them for ourselves as soon as possible. As you I love the taste of black sesame seeds. Regularly I use them as a topping for breads and rolls when I bake them. And I love black sesame ice cream. I made Tuilles several times before and served them with ice cream but here in Singapore the humidity is that high that they stay crisp only for a few minutes. I love this~ it looks so gorgeous! it’s just wonderful. I love the picture with the oriental teapot. Oh these are so so funky! Such a neat idea and gorgeous colour! Lovely creativity Bea. They look just as exotic as those documentaries. Je suis fan de ces tuiles depuis longtemps j’aime tous ces parfums ! tes photos sont superbes plus besoin de le dire j’aimerai pouvoir en faire autant ! Splendide! J’adore les tuiles, et là, quelle originalité! De vrais bijoux, ça donne drôlement envie d’essayer. Tes tuiles sont vraiment très jolies! En plus, j’imagine troooop le petit goût avec le sésame! On dirait des bijoux, quelle délicatesse ! la couleur est superbe!! bravo!!! je suis ton blog, il est soigné et delicat. ciao! What a lovely pairing, Bea. Thanks so much for this spot of beauty on a grey day. Si les tiennes sont aussi exquises que celles de Gamelle (ce dont je ne doute pas), quel bonheur … car j’ai eu la chance de pouvoir les goûter celles de Gamelle !!! Elles sont magnifiques, quelle jolie couleur ! Je suis française et pourtant, je n’ai jamais fait de tuiles… Toutefois, après avoir vu les vôtres, je n’ai qu’une envie: aller acheter tous les ingrédients qui ne se trouvent pas déjà dans mes placards et tenter l’expérience. Merci pour ce voyage imaginaire absolument délicieux. c’est vraiment magnique, chic et original… bravo! J’adore les framboises. En tuile, çà doit être divin. I too, am a huge Michael Palin fan… I recently finished reading his adventures in “Around the World in 80 Days” – a trip he did in the late 1980’s… oh, to have travelled alongside! The colour of the tuiles is beautiful! Oh I love the look of the raspberrry ones! Je ne dirai qu’un mot : somptueux ! Those are truly brilliant…I’ve never seen anything like that. 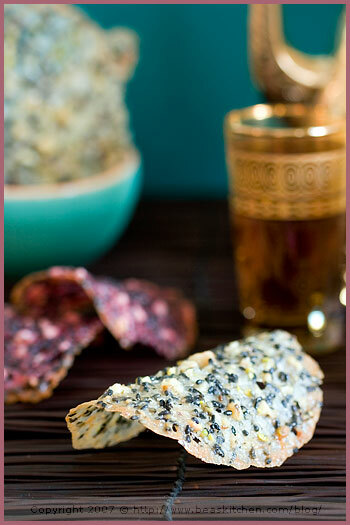 I love to see something surprising like black sesame integrated into a classic recipe like tuiles. But the look of them is just so beautiful, like stained glass or a tiffany lamp. I’d love to taste one! Bea, your tuiles seem like jeweled potato chips to me. Just gorgeous, and I think your choice of flavours is exceptional. By the way, I applaud your use of metric — it is a million times better than imperial. Stunning. That’s one for the book! 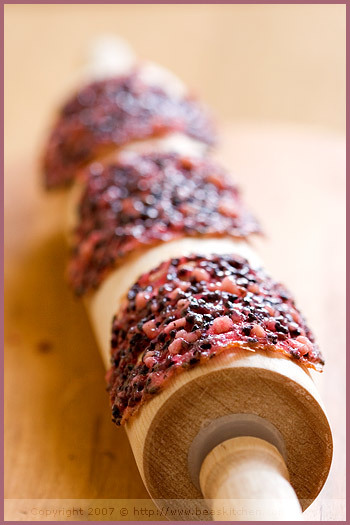 Love the use of a rolling pin for a mold! What pretty little things…almost to pretty to eat, but of couse I would definitely eat them after a few moments of admiration 🙂 Sigh…I know what you mean by travel documentaries making you long for far off lands! I have just discovered your blog and it’s great! I love hearing about Boston since I used to live there and miss it, and love the chance to practice some French. And finally your photos and recipes are amazing, I am at work but just bursting to go home and try some of these! I´ve finally done the meme. Here´s the entry. Thanks so much for the tag! I know what you mean about Michael Palin. I experience serious wanderlust after watching his shows. These sweets are simply superb. Your photos as always are gorgeous. Thank you all for your comments. Merci de vos commentaires. Happy you liked them! As well as the documentaries. So much worth it! Oh Bea – those are too gorgeous for words! And I agree with you 100% on Michale Palin’s wonderful Himalaya series – wasn’t it just the most compelling watching? I want to *be* Michael Palin when I grow up, to face unfamiliar places and situations with such optimistm, gentle humour and good grace. Bea, you must try Tibetan butter tea when you go to Nepal/Tibet/India. I think your tuiles would taste terrific with Tibetan butter tea! Bea, once again you have inspired me with your tuiles. You have a special way of giving. Thank you. those series of traveling by michael palin is fun, isn’t it? our public broadcasting service show them from time to time and we always come back to watch it. your tuiles are gorgeous, i’m imagining they’re very crunchy, sweet smelling! i am blown away by eveything on here!!!!! wow! keep cooking! Sublime, on croirait des perles sur un bijou ! Magnifique ! je découvre ton blog très réussi, et tu es un(e) photographe hors pair ! ton photos sont merveilleuses! Je les aime!